Sisters Lovina Pammet, OSF, and Mary Kay Brooks, SSND. “Dare to Love” is a monthly program that cultivates vocation awareness in the Archdiocese of Chicago through discussion of topics related to vocation discernment and promotion. 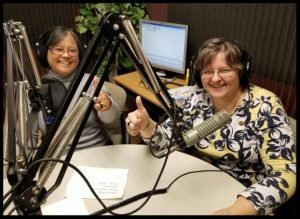 “Dare to Love” is hosted by Sister Lovina Francis Pammet, OSF with co-host Sister Mary Kay Brooks, SSND. The program promotes vocations throughout the Chicago Archdiocese and beyond, providing information and answers about all vocations to area Catholics. Click here to listen to the program!